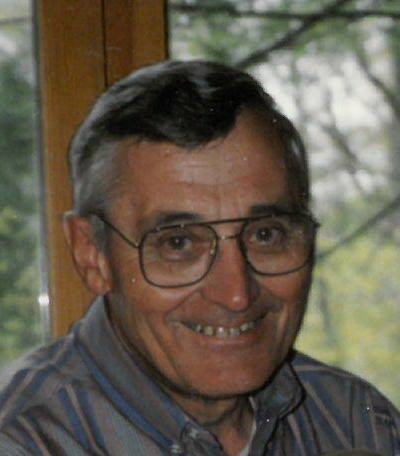 John T. Savoie, age 86, of Gladstone, passed away Friday morning, February 8, 2019, at St. Francis Hospital in Escanaba, surrounded by his family. John was born in Dryburg, MI on May 12, 1932 to Emile and Cecelia (Boncher) Savoie. He was raised in Dryburg and was a 1950 graduate of Rudyard (MI) High School. On January 13, 1953, John enlisted in the United States Army and served until his honorable discharge on January 12, 1955. While in service, John received the Army of Occupation Medal (Germany) and the National Defense Service Medal. On September 14, 1957, after completing his Michigan State Police training and becoming a Trooper, John was united in marriage to the former Charlene Conn in Niles, MI. While stationed in Niles, John and Charlene gave birth to their first two daughters, Madeline and Laura, before taking a transfer to the Flat Rock Post in Trenton, MI. During his assignment in Trenton, John and Charlene welcomed their third daughter, Michelle. In 1966, the couple relocated to Gladstone where they made their home and welcomed two more daughters, Sarah and Renee, to their loving family. John worked out of the Gladstone State Police Post until his retirement in 1981. John was a member of All Saints Church in Gladstone where he also served as a Eucharistic Minister and was in the church choir for many years. He was a member of the Knights of Columbus Brother Felix Council #6667 and loved to complete puzzles, go bowling, golfing, hunting, ice fishing and downhill skiing. He cherished time spent with his family and grandchildren. John is further survived by his 21 grandchildren, 13 great grandchildren with 2 great grandchildren on the way, and his many nieces, nephews and cousins. John’s family will receive friends on Friday February 15, 2019, from 1:00PM to 5:00PM, at the Skradski Funeral Home in Gladstone. Mass of Christian Burial will follow visiting hours, at 5:30PM on Friday, at All Saints Church in Gladstone, with Rev. Fr. Jamie Ziminski officiating. Luncheon will follow in the All Saints Church Parish Hall. The Skradski Family Funeral Homes of Delta County are assisting with arrangements. Contributions in John’s honor can be made to All Saints Catholic Church Music Ministry , Gladstone or Holy Name High School Fund. Wonderful man and was so kind to my grandparents, Elizabeth and Tony Rose, when they were neighbors. He and Charlene are the best! Our deepest sympathy to John’s family…he will be greatly missed. We are so sorry to hear of John passing. He was the best neighbor to our Mom and Dad. The world is a little darker tonight with his loss. May God bless you Charlene and your family. So sorry to hear this Charlene and family. John was a great friendly neighbor. Always there when needed, always fun to talk to. He will be missed so much! Thoughts and prayers go out the Savoie family. To faMily & friends. We hurt for your loss. We love you dearly. God is such a wonderful God to give us such beautiful people in our lives. Be still and know that He is God. This is the day we all long for but it’s hard letting go. We love you Tiger & Renee. BREATHE. It is He who is within us. Best dad a girl could ever have, which having five girls he had experience ❤️❤️ He was not only dad but my best friend ❤️ now at peace spoiling my daughter in heaven, his grandfather Sabrina Maxine. To such a loving, kind, gentle hearted and patient man. Grandpa, we love you and miss you dearly. Plus, no one will ever rock a puzzle like you will, or have a Donald Duck voice to stop our son in his tracks in curiosity and want cuddles. To all the family we express our thoughts and prayers. May God comfort all of you in this difficult time. The best dad I could have ever asked for. From golfing, to skiing, to snowmobiling, to teaching me about car’s and home improvements. The lessons I learned from my dad I will carry throughout my life. He was always there to love me and be my biggest defender. He was the master of unconditional love. There is a huge hole in my heart. I have always considered myself the closest thing to him having a son. Until we meet again dad. I will carry you with me in my heart forever. We were so sorry to hear of John’s passing. You were all good neighbor’s to us as we lived across the alley from you. You girls were great babysitters for us as we raised our three daughters. John was a kind and gentle man and I know you will all miss him. Take care of each other and cherish your memories. We celebrate John’s new life of joy! Renee, Im so sorry to hear of your dads passing. You & your family are in my thoughts & prayers. Savoie family: I’m sorry to hear of Mr. Savoie’s passing. When my husband and I moved into our house a couple years ago, I wondered who the kind man with the cute “Lassie looking dog” was that walked by our house, and my mom told me about Mr. Savoie and how nice he was. My husband and I will miss seeing him walk by with Duffy this summer. May God comfort you all during this difficult time. Ronald Gervais called this morning to pass on the sad news about John’s passing. We are so sorry. Our high school class had/has a special bond with each other and we have missed seeing you and John at our reunions the past few years. Your John was a kind, caring and soft-spoken gentleman. We will treasure our memories of him. Our deepest sympathy to you and your family. To my favorite police officer uncle john. You had so much patience and such a loving person. When I had a car accident as a very young driver and hit a police squad car in buchanan Michigan after skidding into the oncoming lane because of rainy weather…and did not get a ticket…you would always tease me about this incident…I was coming home from mass from saint Anthony’s catholic church…we down here in elkhart indiana and niles Michigan will cherish all the great memories of uncle john. We are so sad at his leaving but know he is awaiting the rest of us in the forever hello. Diane stephanie chuck June conn and our family way down here. Wish we could be there but we are in spirit. Love to all you yoopers. In christ. some time with him and his family when he lived in Benton Harbor and St Joseph,Michigan. Please accept my condolences in Jack’s name. John thank you for your service. I pray that the Good Lord is holding you and your family close.